Calming warm neutral browns and yellows help create a sense of peace, harmony and nature. 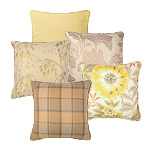 Charming cushion collection featuring floral, patterned and plain designs with calming warm neutral browns and yellows helping create a sense of peace, harmony, nature and relaxation. These cushions were designed to go well with light and dark tones of the following colour schemes including white, cream, yellow, brown, green, grey and orange, but will easily fit in the custom colour designs for the creative at heart.